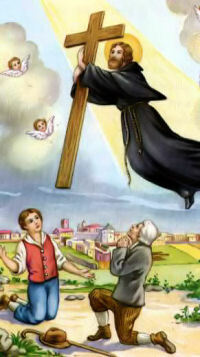 Today is the memorial for Saint Joseph of Cupertino. I would suggest reading this short explanation of his life at the Catholic Encyclopedia, New Advent.org. While attending Franciscan University of Steubenville for my graduate studies in Theology, I first came in contact with the Prayer to St. Joseph of Cupertino. I prayed it often during my time at Franciscan. When I left to teach high school theology at St. Dominic Savio Catholic High School in Austin, Texas, I brought the prayer with me and taught it to my students. It was great to see the students praying it on their own as well as telling me that they prayed it in other classes, especially those students who had Physics. I heard those exams were tough! O Great St. Joseph of Cupertino who while on earth did obtain from God the grace to be asked at your examination only the questions you knew, obtain for me a like favour in the examinations for which I am now preparing. In return I promise to make you known and cause you to be invoked. Through Christ our Lord. Amen. St. Joseph of Cupertino…Pray for us.